The nature reserve "Nunkirche and Rochusfeld" near Sargenroth is actually quite a small area, but the slow-growing perennial mat grass meadows (nardus stricta) here have a biodiversity that cannot to be found elsewhere in Hunsrück. Rochusfeld is also worth noting for its high percentage of endangered wild plants and plant species. These are threatened much less by picking than by the changes to their living conditions, which have occurred very rapidly over the last decade, giving the plants no, or much too little, time to adapt. Whilst in the past the increase of agriculture in combination with the drainage of wetlands and excessive fertilization of even poor grassland was the main threat, global warming has now worsened the situation. The result is that the more difficult climatic conditions make the traditional location of native plants increasingly questionable. 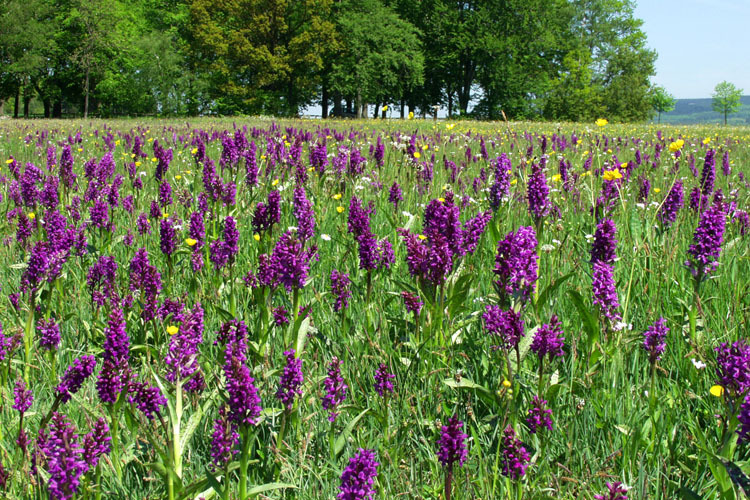 Every year, during the first weeks of May, Rochusfeld offers a splendid display of orchids, ranging from deep red to violet in colour It is the season of Spotted Orchids ("Manns-Knabenkraut") when thousands of bright, radiant blooms cover the field. This is truly an impressive sight since wild orchids have become very rare in the modern landscape. So the task of protecting the annual magnificent show of orchids in Rochusfeld for future generations falls to this nature reserve near Nunkirche.